Farming, horses, cattle and philanthropic interests keep Loren Booth involved with life’s challenges and pleasures. Tucked away in the foothills of California’s San Joaquin Valley lies the agricultural town of Orange Cove. 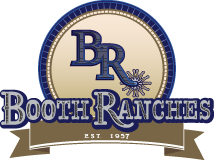 Reining enthusiast Loren Booth lives amid the horses she loves and citrus trees she grows, nearly two miles from the entrance to Booth Ranches LLC.